Stay calm, at least the 911 isn’t going anywhere. Subaru and Toyota or Mazda and Fiat. What do these automakers have in common? The fact that each has paired with the other to develop small sports coupes that would be too expensive for a single brand to justify building all on its own. One would think that an automaker that made its name on the back of iconic sports coupes wouldn’t face the same issue because it would be used to the trickle of sales the segment generates, but according to , that’s not the case for Porsche. Porsche became the famed automaker it is today all thanks to the 911. It later began offering a distilled version of its performance car, the Cayman and Boxster, in order to take a larger share of the performance market. But now, Porsche is reportedly considering dropping the axe on both models. 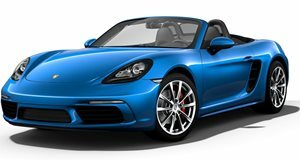 The Boxster was originally released in 1996 and was followed by the Cayman in 2005, but as compact sports car sales continue to dwindle, 718 Cayman and Boxster engineers in Weissach may soon lose their power to convince the bean counters to keep going. Before you pick up pitchforks and go after wealthy sports car-averse SUV buyers, keep in mind that Porsche’s crossroads decision can’t only be chalked up to poor sales. The other factor behind the squeeze on the 718s comes from the regulatory side. With governments around the world requiring the next generation of cars to emit far fewer pollutants than they do now, Porsche faces the challenge of making the 718's successor both fuel efficient and fun, and pulling both off is not exactly cheap. Fortunately, Porsche does have other options to consider before it decides to kill the 718 twins off entirely. It could keep the current cars alive and continue to keep dealerships stocked with 718s by supplying minor or major revamps based on the current hardware, or it could go the expensive route and build an entirely new electric sports car based on a shorter version of the Mission E Platform. The scenario we like best, however, is if Porsche were to decide to team up with its sibling Audi to share costs on a small sports car the way Subaru and Toyota did with the BRZ and GT 86. Whichever ends up happening, at least we know the 911 isn't going anywhere.